Jamie Scholes won the Young Performer of the Year award. City of Peterborough Swimming Club (COPS) picked up two top prizes at the annual Cambridgeshire Living Sport Awards presentation evening last night (November 26). They collected the team of the year award after winning 18 medals at the British and English National Championships in 2015 and Jamie Scholes was the recipient of the Young Sports Performer of the Year award. 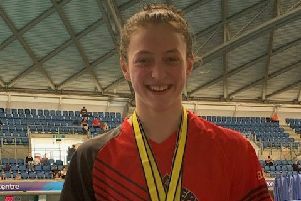 Jamie won a gold and two silver medals at the British Championships in Sheffield and also represented England in an International meet in Italy. There was also a Peterborough winner in the Disabled Sports Performer of the Year category. That honour went to Peterborough City Rowing Club member James Fox, who is a Paralympic Rowing World Champion and a Rio Paralympic hopeful.